recover lost deleted formatted ppt from EXFAT/FAT32/NTFS hard drive system or external drive, usb drive. pptx file recovery - Aidfile recovery software is best software to recover PPT files after format , recover PPT files after format hard drive, usb drive ,etc. Use "Undelete" mode to recover deleted PPT files from hard drive. Use "Unformat" mode to recover lost PPT files after format hard drive. Use "Recover partition" mode to recover PPT files if hard drive partitions changed or damaged or deleted. Use "Advance Scan" mode to recover lost PPT files if hard drive partitions show as "raw" or recover deleted PPT files which can not be found with "undelete",recover PPT files from raw partition,recover PPT files of partitons which are not NTFS,nor exfat,nor fat32. Aidfile data recovery software is the best PPT(powerpoint) recovery utility designed to recover and repair Powerpoint presentation files which are formatted, Improper system shutdown and errors on the media where (.ppt, .pot, .pps) files are stored. The Aidfile data recovery Software tool provides easy access to your formatted PPT(Powerpoint) Presentation (.ppt, .pot, .pps) files with new readable files. 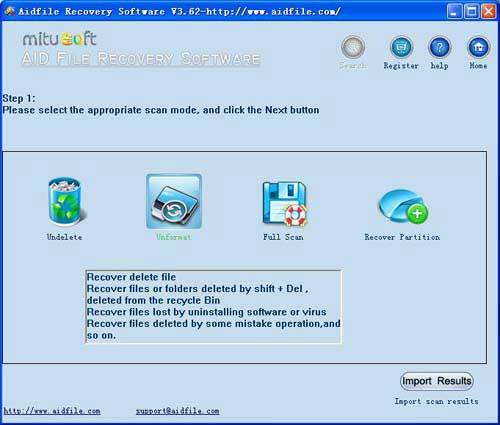 Aidfile data recovery Software tool recovers formatted master slides, images, objects, text, animation effects, sound effects, auto shapes (Basic shapes, callouts, block arrows, flow charts, action buttons and connectors), word files, excel files and word art.